"I've been waiting for that bright sunshine to show up and shine in my back door someday." The beautiful yellow lily that Ogre bought me last spring multiplied like mad! I've been watching them start to bloom through my back door for days, but it didn't occur to me to water them - until right before I took this flower photograph, of course. That is so pretty!! Love the color. Gorgeous! Your water drops make it sparkle! pretty lilies! I had one big yellow pop up this year. last winter was so bitter many things died or are not blooming this year. No blooms on my tree peony, sure hope it comes back next year. It is one of my favorites. I don't think I've ever seen lillies that colour before. Just gorgeous. BOOM! THAT is so yellow. Beautiful Lillys!!! Love the yellow!!! What a stunning colour. Beautiful. How beautiful! My mom always grew lillies when I was growing up, love them. Ooh! So pretty--and the water droplets on the ones in the background, what a beautiful touch. We have orange ones that grow wild in the road ditches...love them! I've always loved lilies, they're a flower that can make a ho-hum bouquet look spectacular and it only takes 2 or 3 of them. 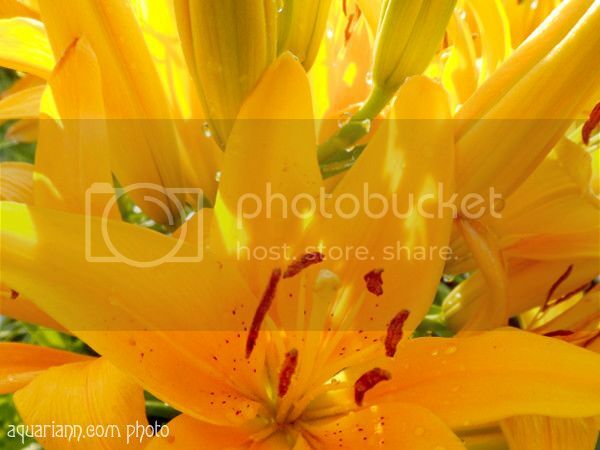 The sunny color of your lilies certainly make them a cheerful addition to the garden. I wish I had those lilies in my back door as well..stunning!